There’s an old, biblical parable about two builders. One constructs his house on rock, the other on sand. The latter comes a cropper when the rains descend, washing away his audacious structure. “And it fell. And great was its fall.” The lesson? Hubris never pays. 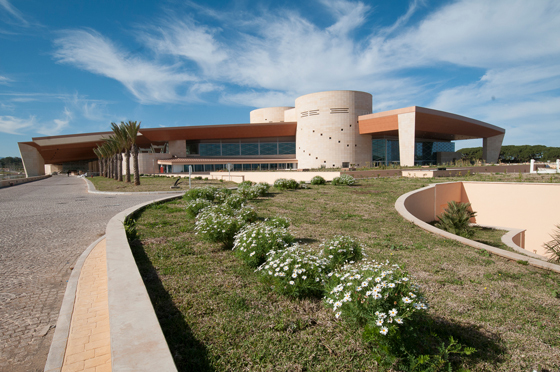 Italian architectural office Fabris&Partners’ ambitious new international conference centre in Algiers listens to the landscape. Here, sand isn’t an issue, as hubris makes way for respect – both for the immediate, dune-filled geographical context and for the formal language of the local culture. 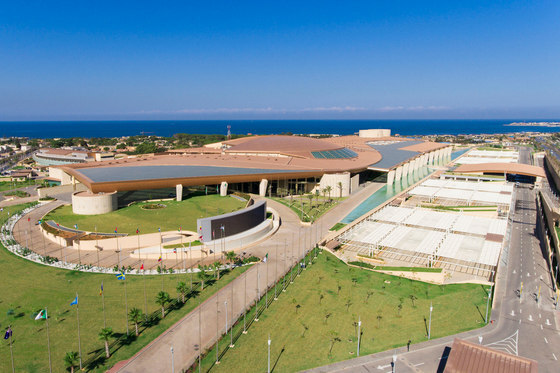 “What we didn’t want was to make a huge impact, when inserting this great volume into the landscape” says partner Valentina Fabris of the 220,000-square-metre venue on the Mediterranean. 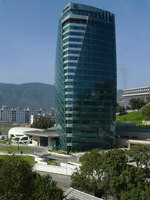 The largest multi-purpose complex in the region and the fifth-biggest in the world, the Centre Internationale des Conférences d’Alger (or CIC) chooses to lie low, so to speak, harmoniously dovetailing with its topographical situation, rather than positing itself as counterpoint. 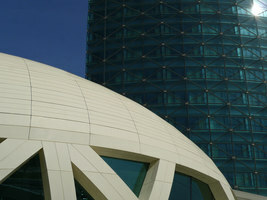 Its significant scale notwithstanding, the structure manages to ventriloquise its surroundings – in terms of both form and colour – so much so that the architects describe it as wearing “camouflage”. 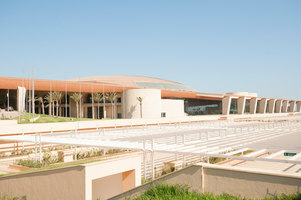 “The building form is defined by a roof with a fluid shape,” explains Fabris, “that is in keeping with the undulating movement of the dunes.” Various stones, including chalk for the main, carved facade – an abstracted take on the traditional arabesque pattern – make for a muted, earthy chromatic language. 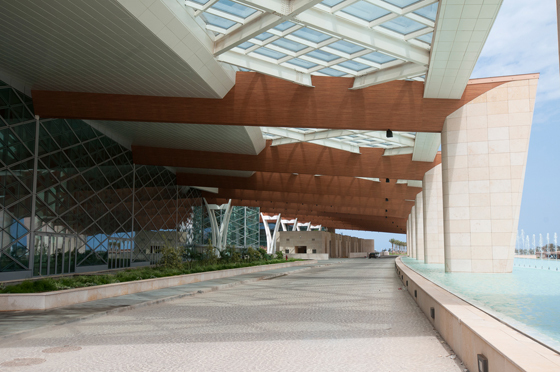 Like the constant shifting of the nearby sands, so this landmark project’s interior has been developed to respond to the ever-changing needs of its users. 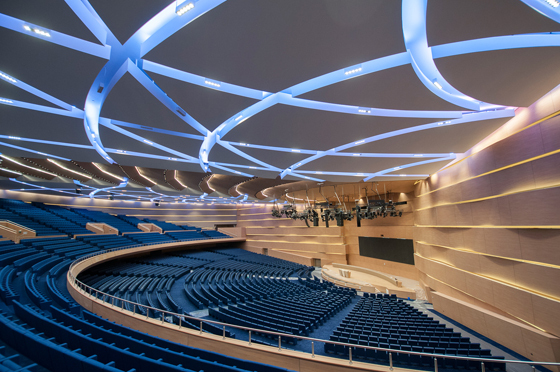 Conceived of a series of highly flexible spaces, which can be partitioned or opened up – not only in the horizontal, but also in the vertical – the venue has been designed to host international-level conferences and congresses, as well as logistically complex banquets and expositions. 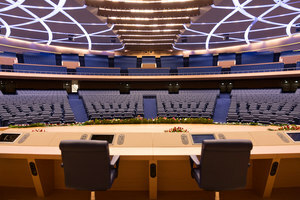 With a 6,000-seater auditorium and a conference hall that – replete with desks and electronic voting system – can accommodate over 700 delegates, as well as a myriad other multi-purpose spaces, including banqueting rooms, restaurants, an exhibition space, offices, retail spaces and even television studios, we’re definitely in the superlative league here. 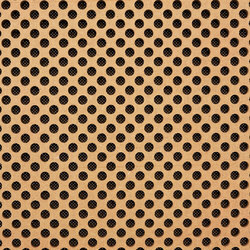 But large internal spaces, highly populated, present a problem that isn’t always addressed during the design-development process: acoustics. 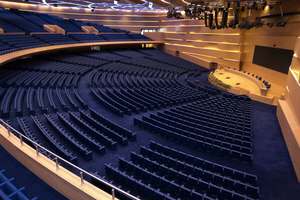 Astonishingly not always on the teaching agenda in formal architectural training, sound management can make the difference for users between a space that sings and one that makes you wish you were hard of hearing. 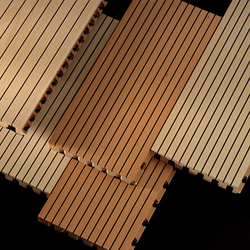 For Fabris&Partners, however, the acoustic performance of the CIC was anything but an afterthought, bringing as they did premium Italian manufacturer Fantoni on board during the project’s early concept stages. 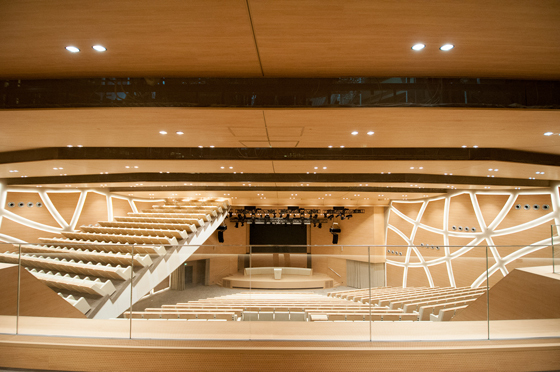 Working to a budget of €2.5 million, and for an exacting end-client, Fantoni collaborated with the architects on a total acoustics scheme. 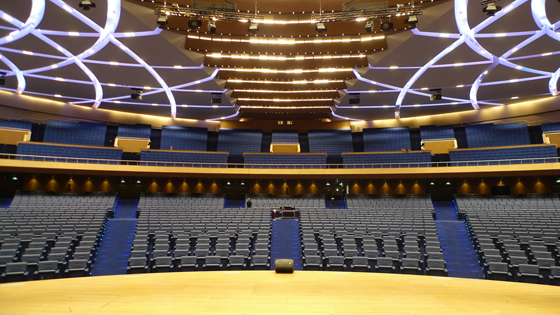 The walls of the main auditorium saw the installation of high-quality 4akustik panel cladding, whose 5mm-hole perforation delivers unparalleled sound deadening across the frequency range. 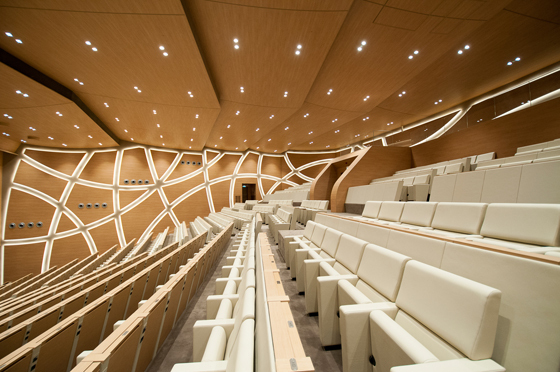 Smooth ceiling panels, meanwhile, also with an oak finish, strike an optimal balance between sound reflection and absorption. 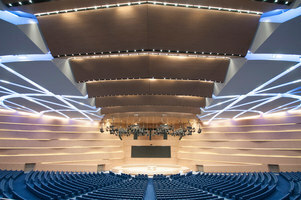 In the conference hall meanwhile – which features a mechanism that allows the entire conference stand and its 750 seats to be raised, revealing a hall beneath it – a complex acoustic design has been implemented. 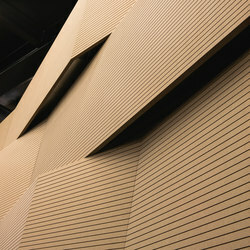 Custom-made, drilled panelling was specified to create an optically sophisticated and technically advanced environment, visually continuous with many of the CIC’s public areas, where the same product was also installed. 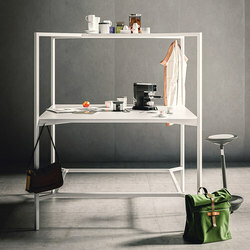 Such adaptability allows for a consistent, uncompromised architectural vision. 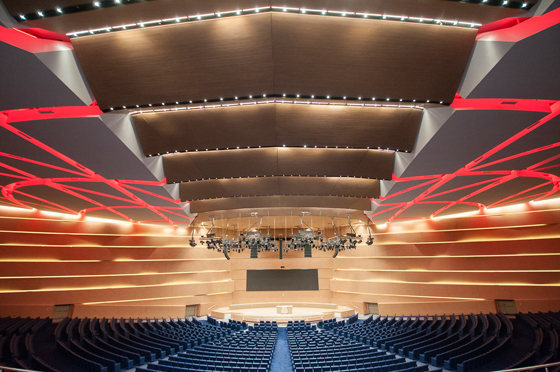 When it comes to adding real architectural value through premium acoustic systems, Fantoni is making itself heard – loud and clear.